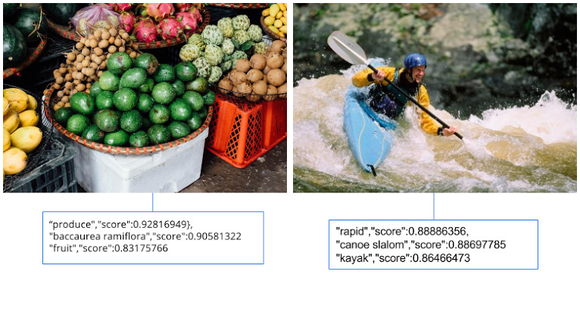 Developers can now easily build powerful applications that understand the content of images thanks to new machine vision tools released by Google. The company unveiled the beta of its Cloud Vision API on Wednesday, giving select developers an opportunity to run advanced image processing services that let their applications more easily handle pictures. Applications can use the tools to do things like identify the most important thing in an image, determine how someone feels from their picture, and detect whether the content of an image is inappropriate. For example, the Entity Detection feature picks out the dominant thing in an image and tries to identify it in a way that can then be used by an application. For example, a picture of a bunch of produce would return the result “produce.” Landmark Detection allows apps to identify pictures of popular natural and human-created structures, and know where on a map those structures lie. One feature in particular is useful for companies building applications that include sharing crowdsourced images. The technology that powers Google’s SafeSearch tool for blocking inappropriate content is now available to developers through the Safe Search Detection feature. Right now, the Cloud Vision API is only available to approved users. Developers can fill out a survey here to request access to the tools, though they’ll have to lay out what they plan to do with them. Google is releasing the API as its competitors in the cloud also try to attract developers with tools that provide easy access to advanced capabilities. Microsoft is selling access to its Project Oxford image processing APIs, and continues to roll out capabilities for those services, while IBM has made its Watson services available to developers.